You can get instant Free CIBIL Credit Score on WhatsApp. It is a new facility is launched by Wishfin, a fintech startup in association with WhatsApp. A credit score is a three-digit number which determines a creditworthiness of an individual. The credit score is decided based on credit history. Credit scores are provided by companies like CIBIL, Equifax, and Experian. The value of your credit score ranges between 300 -900. The credit score plays a significant role when you are applying for the loan. Higher the credit score, the higher are chances of your loan application getting approved. Higher credit score will help in getting quick loans and visas for certain countries with ease. In good old days, it was difficult task to get a credit score, even companies used to ask money for credit information report. However, now it is easy you can get Free CIBIL credit score on WhatsApp. This facility is known as WhatsApp for Credit Score. This is a unique facility where an individual can get credit score on WhatsApp. 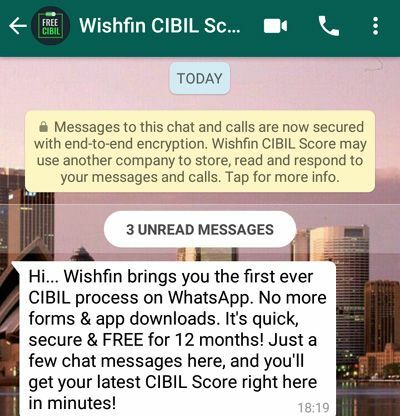 Let’s take a look at steps to check CIBIL Score Free on WhatsApp. There are two methods to check CIBIL Score on WhatsApp. Give a Missed Call on 8287151151. Your mobile will be added to WhatsApp Chat. Make sure that WhatsApp is installed and operational on your mobile. You will receive a message on WhatsApp asking your Full Name. Once you enter your name it will ask birthdate and gender. Once you provide this input, it will ask for PAN Number. After entering PAN you need to provide your address and city of residence followed by state and pin code. At last, you need to provide your Email ID. Once you are done you can see latest CIBIL Score in WhatsApp chat box. Visit wishfin website check CIBIL score section. 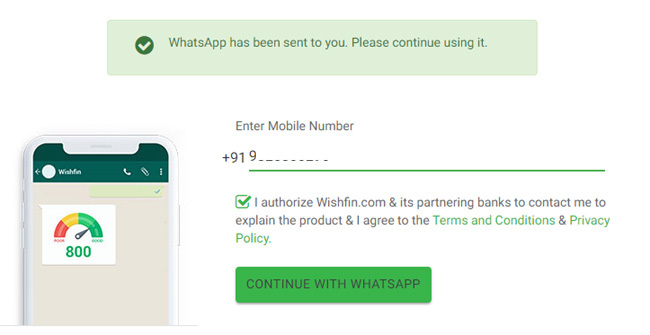 Enter your mobile number and click on consent about contacting you for products of wishfin. If you don’t give consent it will not allow you to move forward. Click on “Continue with WhatsApp” button. You will also receive a message on WhatsApp asking about your personal information as described in the first method. Once you provide the required information you will receive CIBIL Credit Score. Once the process is complete you will be removed from Wishfin CIBIL Score Group. You need to make sure that detail you share, match with your banking records. It’s important for getting an accurate score. Should you check Credit Score via this method? First of all, the method introduced by wishfin is a lengthy method. After giving miscall end user still needs to provide a lot of information including PAN card for getting a credit score. They could have thought to fetch information according to a mobile number. Although wishfin is partnered with CIBIL for credit score, I would still recommend using simple method of getting CIBIL credit score along with report. One simple reason is CIBIL credit report contains lot of information including loan repayment history, outstanding loan amount etc. Which are other methods to check Credit Score? A simple method to check credit score along with credit information report is given below. Visit CIBIL Free Credit Score Section. Provide basic information including username, password, full name, e-mail and telephone number. Click on continue to step 2 and you will be prompted to provide information like date of birth, gender, address and identity proof number. Once you accept and move to step 3, you need to verify your identity. Once you verify your identity you will be able to access credit score along with credit information report. I hope the information given above will help you in getting your Free Credit Score.